As a researcher, you spend a lot of time doing and thinking about science. Stacey likes to take her mind off research when she’s not in the lab by doing yoga and road biking. She and her husband also enjoy cooking and eating their delicious kitchen creations. Stacey studies different biological rhythms and the circadian clocks within organisms that create and maintain those rhythms. Circadian clocks can be found in a wide variety of organisms, from bacteria to people. 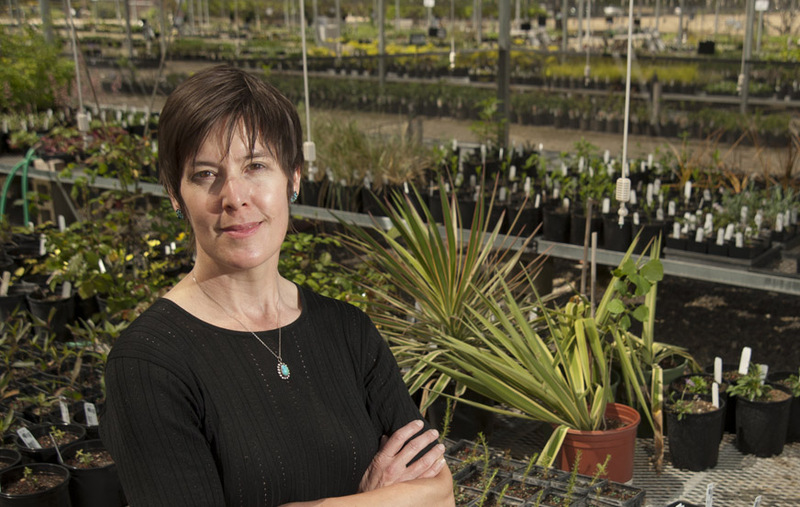 In particular, Stacey is interested in understanding why plants have circadian clocks, how these clocks work in plants, and what aspects of physiology and development these clocks control. Early on, Stacey wanted to be a veterinarian. Though she loved animals and the outdoors, Stacey didn’t enjoy her biology classes in high school. However, after exposure to phenomenal teachers in college, she realized she was fascinated by how living things worked, especially at a molecular level. Stacey wanted to get experience working in a lab as an undergraduate to help her decide if research was something she really wanted to do. She had an amazing experience working in a research lab, and this helped her decide to pursue a career in academic science. As a graduate student, Stacey went through a phase for a year or two where nothing was working. She had problems with experiments including mistakes in setting up protocols and equipment breaking, but what was especially frustrating was that the biology wasn’t working the way she thought it was. Stacey put in a lot of time and effort, but didn’t have much to show for it. Ultimately, she made it through by keeping multiple lines of experiments going and focusing on the projects that started to yield interesting data. Stacey has been trying for the past few years to understand the function of a gene in which mutations cause the circadian clock in a model plant to run at a different pace. This gene is highly conserved across many types of organisms, but no one really knows what it does at a molecular level. By looking at previously collected data, Stacey and her colleagues have developed a hypothesis that this gene may code for a protein involved in repairing damaged DNA. They are excited to be running new types of experiments to follow up on this possibility. Stacey and her husband were both invited to give presentations at the Umeå Plant Science Centre in Sweden where one of their friends works. The trip was a phenomenal experience both scientifically and socially. It was fun to travel with her husband, and they were able to spend some time exploring Sweden. Hiking through the spectacular forests in the Abisko National Park in September when the birch leaves were turning gold was particularly memorable. At UC, Davis they used to have a summer cook-off competition where each lab took making snacks for a departmental coffee break. They assigned judges who would taste the entries each week, and the winning lab was given a trophy at the end of the summer. It was fun to get everyone together to share their scientific and culinary creativity. Remember, it’s your career. As a scientist, you are responsible for your own productivity, but you also have the freedom to pursue the research questions you are excited about. Try not to focus on chasing the next big thing in your field. Take the time to identify a problem you are really interested in. If you do this, you’ll work harder and will probably be more successful and happy in your job. Stacey earned her bachelor’s degree at the University of California, Berkeley, graduating with Highest Honors and Highest Distinction in General Scholarship from the Department of Biochemistry. She then went on to earn a PhD at the University of California, San Francisco, in 1998. While at UCSF, she was a Howard Hughes Predoctoral Fellow in the laboratory of Dr. Tony DeFranco, where she studied mechanisms underlying B cell receptor signal transduction. For her post-doctoral studies, she switched from immunology to plant biology to work with Dr. Steve Kay at the Scripps Research Institute as an NIH National Research Service Award post-doctoral fellow. In the Kay lab, she studied the molecular basis of circadian rhythms in Arabidopsis thaliana. She joined the faculty of UC Davis in 2002, where she was recently named a Chancellor’s Fellow. Her lab uses genetic, biochemical, and functional genomics approaches to investigate mechanisms underlying the plant clock and its role in the coordination of plant physiology. Her research is funded by the National Science Foundation and the National Institutes of Health. She is an active member of the broader research community, currently serving on the editorial boards of the Journal of Biological Rhythms, Plant Physiology, and PLoS Biology.